A DIY hat doesn't always require precise cuts and advanced sewing skills. In fact, some of the most memorable hat tutorials involve upgrading existing hats with personalized details or making a hat out of something unexpected. We've gathered several creative hats to make in your spare time. Some involve a little bit of sewing, but most require no sewing at all. Sort through whichever tutorials speak to you and then think about ways you can customize the idea even further. One way to make a felt hat look more expensive is to add some whimsical stitching to the side, and embroidery is a common technique used to accomplish this. Learning how to embroider is easy when you have the right tools, a free pattern, and an easy to follow tutorial. This step-by-step guide offers some must-know tips to help you recreate this hat in a few hours or less. Adding some southern charm to a plain baseball cap is simple. In fact, Deonna from Child at Heart makes the process as seamless as possible, literally. If a flannel heart isn't your taste, consider other appliqués that might work for you. This tutorial can be used to apply various fabrics in any shape to any hat that has a blank spot. Summer is a time to let loose and relax, so express that sentiment with a customized floppy hat that doesn't take itself too seriously. There are dozens of designs you can paint to make a floppy hat look more cutesy, and we love this donut idea from Kelly at Studio DIY. Check out this step-by-step to make something similar. Jenni from I Spy DIY believes that a sour mood induced by cold weather can be uplifted with a little bit of sparkle, and we don't disagree. This step-by-step shows you how to add jewels to a basic winter cap and provides a couple of different patterns to follow. Don't limit this DIY to just winter hats. Experiment adding jewels to baseball caps and other basic hats. Do you have a hat you used to love but have outgrown? Customize it. Cassie from Hi Sugar Plum wasn't a fan of the band of fabric on her straw fedora. To make the hat her own, she removed the band and decided to embroider a chevron design in its place. Her DIY hat tutorial only requires two supplies and is easy to follow. One quick way to update a hat is to add a tassel or pom pom trim. Lisa at Creative Fashion Blog offers not one but two cute ways to update beach hats using this method. What's more, by picking out a festive trim, you'll be able to match a beach hat to an existing beach towel or bathing suit in no time. Erica from Honestly WTF loves hats and loves pearls, so it only made sense to combine the two in this clever, easy-to-follow hat tutorial. The best part about this project is that the band is removable, so even if you eventually get sick of the pearls, no damage was done to the hat. This type of temporary upgrade is important when you're dealing with vintage hats and fedoras that are valuable. Fran from Fall for DIY comes up with the most ingenious yet simple tutorials in her "Make it Easy" series, and they are perfect for beginners. This hat upgrade from the series is inspired by a hat from Anthropologie and requires only one tool to complete. Check out her break down to learn how to recreate this hat without fail. Hats can lend a lot of personality to an outfit. They can add a hint of sophistication, elegance, or rock and roll to an otherwise lifeless ensemble. To make a formal hat more rock-inspired, Cathy from Trinkets in Bloom added some embellishments. Check out her tutorial to learn how she used a chain and buttons to transform this hat into something new. Joëlle from Wonder Forest loves exploring personal style on her blog and isn't afraid of experimenting with clothing she has outgrown. In this tutorial, she teaches readers how to convert an old sweater into a stylish and functional beanie. The best part? No sewing required! When attempting a new DIY technique, it's essential to find a tutorial that is thorough and easy to follow. This wet felted hat tutorial from Felt Magnet provides all the resources necessary to teach someone how to shape a hat using a wet felt technique. Although this project requires some patience, the end result is a gorgeous and elegant cap that's perfect for a fancy night on the town. While the majority of these DIY hat ideas require little sewing, we wanted to include a tutorial or two for ambitious seamstresses to try. This handmade hat tutorial goes through all the steps required to make a reversible sun hat. Once complete, you'll end up with two wearable hats instead of one. Basic trucker hats can be customized easily. 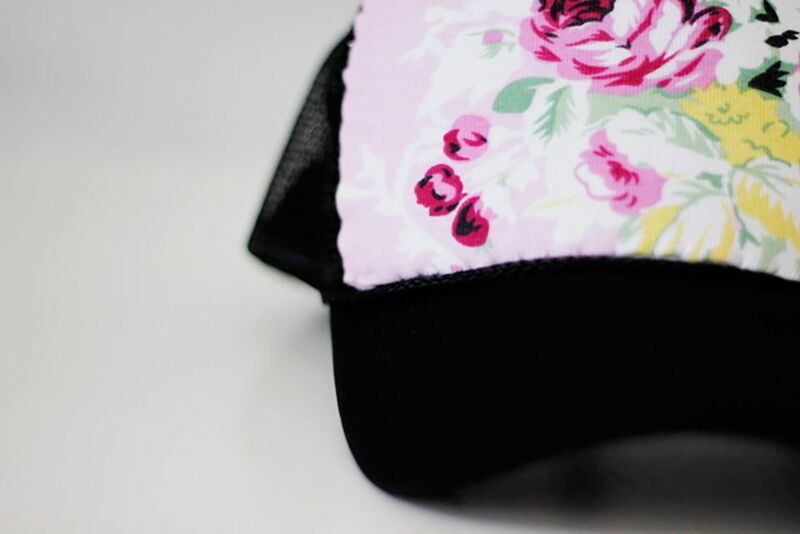 One way to make these hats one-of-a-kind is to add your favorite fabric to the front section. Kate from See Kate Sew wanted to add a floral touch to make this masculine hat a bit more feminine. Check out her tutorial to see how she adhered the fabric in a few simple steps. This DIY hat idea takes the patch craze to the next level by creating patch-like stamps using bottle caps. Vanessa from I Love to Create will teach you how to make personalized stamps that you can use on a blank baseball hat or any other fabric or craft project you desire. DIY hats for the Kentucky Derby range from extravagant and whimsical to simple and elegant. If you like to celebrate the event by wearing a Derby hat, but don't have much time or funds to spare, check out this tutorial from Beth at The Frenzied Hostess. This step-by-step will show you how to make this hat in 10 minutes or less. Most felt hats are expensive, but there are a few more affordable options on the market. The problem is that these less expensive versions tend to be very basic. Xenia from Fashandrolla was determined to make her purple felted hat more custom by tooling some leather into a butterfly hat embellishment. Follow along and learn how to make your own customizable leather accents. According to Maggy from Red Ted Art, finger knitting is a great way to get kids interested in knitting. To us, this means that finger knitting is also an ideal technique for beginners or people with no knitting experience. To get started, all you'll need is some yarn and fingers. Once you get the basic stitch down, this tutorial will show you a straightforward way to recreate this beanie. Jan from Poppytalk shares some simple yet effective tutorials, and this hat transformation is one of our favorites. To complete this DIY, the first step is to go to a thrift shop and hunt down a vintage felt hat. Next, head on over to the tutorial for more details on this hipster-inspired embellishment hat project. Looking for a really quick hat tutorial? Sara from Creative Jewish Mom made this no-sew fleece hat in less than ten minutes. It might take you a bit longer to make at first, but once you get the hang of it, you'll be able to recreate this hat in a similar amount of time. These fleece hats make fun gifts for children of all ages. Keep an eye out for when fleece fabric goes on sale and stock up.